An app where many Silicon Valley employees go to silently scream about their big tech jobs is embracing the #MeToo movement. SAN FRANCISCO — There's a place where many Silicon Valley employees go to silently scream, airing grievances about their big tech jobs and blowing off steam — all under the cloak of anonymity. Blind, an anonymous workplace community app that has served as a virtual water cooler for many in Silicon Valley since its launch in 2015, now wants to be a sounding board for people to share their stories of sexual harassment in the tech industry. On Monday, the app started a new #MeToo section. At least one in four women reported being the victims of sexual harassment in the workplace, according to a 2016 report from the U.S. Equal Employment Opportunity Commission. And most people who reported feeling harassed, according to the commission, did not file a complaint. Wonshin Lee, head of U.S. operations at Blind, said in a news release that integrating a #MeToo platform into Blind was building on the app's mission to "empower every employee, regardless of title or position." Silicon Valley has already been flooded with #MeToo stories. Months before the Harvey Weinstein scandal opened the floodgates, Uber was forced to publicly grapple with a culture of gender discrimination and sexual harassment following a blog post from a former engineer, Susan Fowler. Female startup founders have also described inappropriate conduct from male venture capitalists, whether it was over drinks to pitch their ideas, at a conference or even in the workplace. As of Monday morning, a few stories and many more comments had already been posted under #MeToo on Blind. "I’m not in tech like the rest of you, but I do work at a popular startup in SF, so I guess that’s close enough," one user wrote. "My friend sent this app to me tonight because we’re both dealing and have dealt with similar issues of harassment and assault in the workplace." 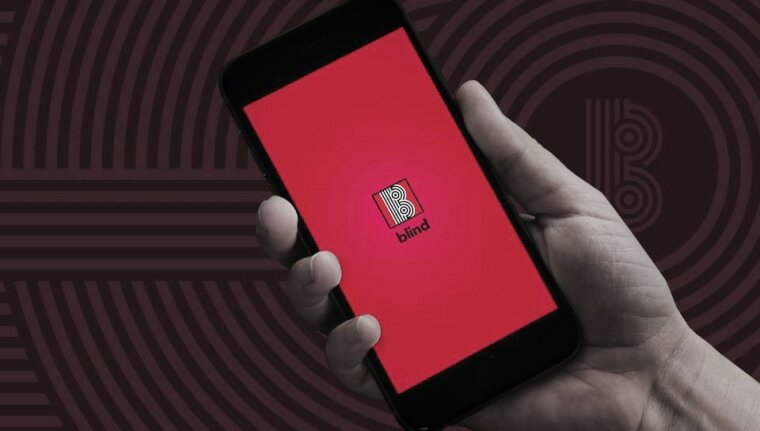 Blind's selling point is that the free app is a place for people to speak freely, without the fear of retaliation in the workplace. It's also a place people turn to when they feel their human resources departments are failing them, Kyle McCarthy, Blind's head of marketing, told NBC News in an email. Signing up for Blind requires verification through a work email address or via LinkedIn to ensure people who are posting actually work where they say they do. The #MeToo channel is one of a select group of publicly viewable topics anyone can contribute to, regardless of whether they work for a tech company. If a user is already registered as working for a tech company, they'll also have the option to hide the company they work for before posting. Makers of the app, which launched in Seoul in 2014 before coming to the United States the following year, declined to say how many people actually use it. However, the company provided NBC News with a list of the top 50 companies on the app and the number of employees from each one that are registered with Blind. The top five include Microsoft at 35,000 members; Amazon with 15,000; Google with 7,000; and Uber and Facebook with at least 5,000 members each.